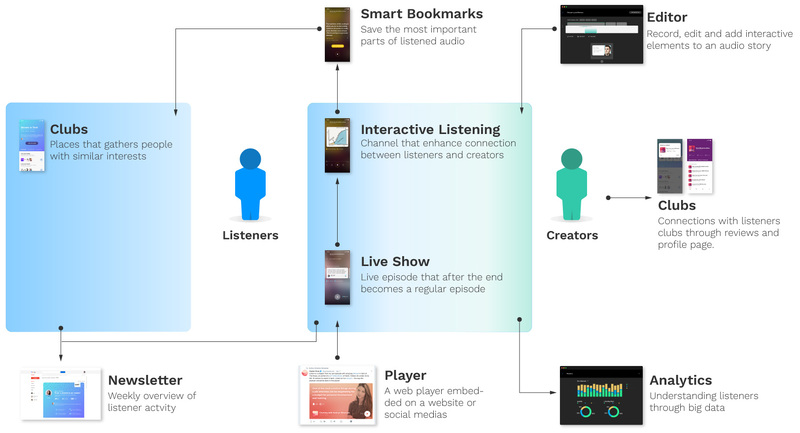 Through analyzing existing behaviors and looking at emerging trends, I investigated how interaction and system design can help to envision a community publishing platform for listeners and creators. Final solution consists of a platform, Cast3, with two separate products directed to listeners and creators. Users can connect with similar minded people around specific topics inside a community. 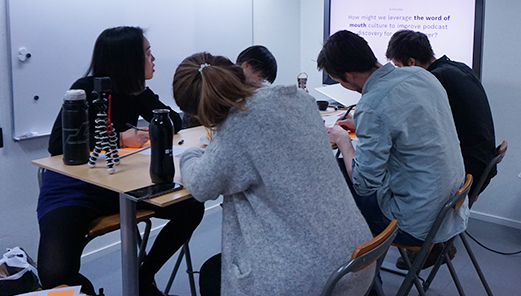 The MFA Thesis was conducted at Umeå Institute of Design during first 20 weeks of 2018. The users of the platform can interact with audio stories through a redefined media format called freecasting. The new format improves a listening experience and puts emphasis on communication between listeners and creators. Here you can see interacting with a sharable quote (prototyped in Framer Studio). The platform gives users a possibility to connect with similar minded people through clubs. The clubs are the spaces where listeners can exchange information, discover new content through a word of mouth and bond with the creators through live shows. 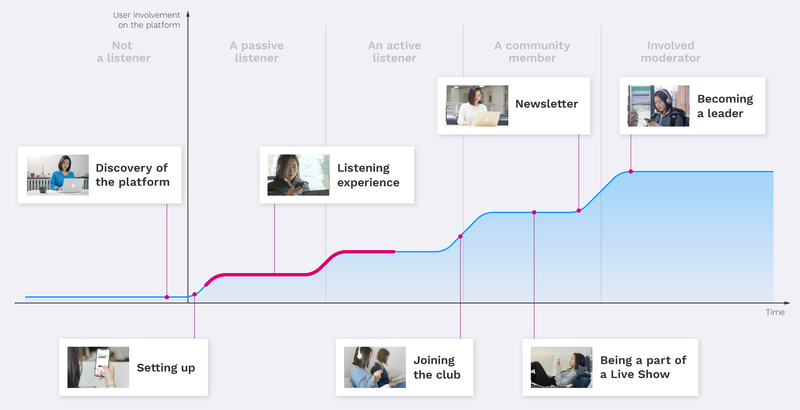 Here you can see an overview of a club (prototyped in Flinto). 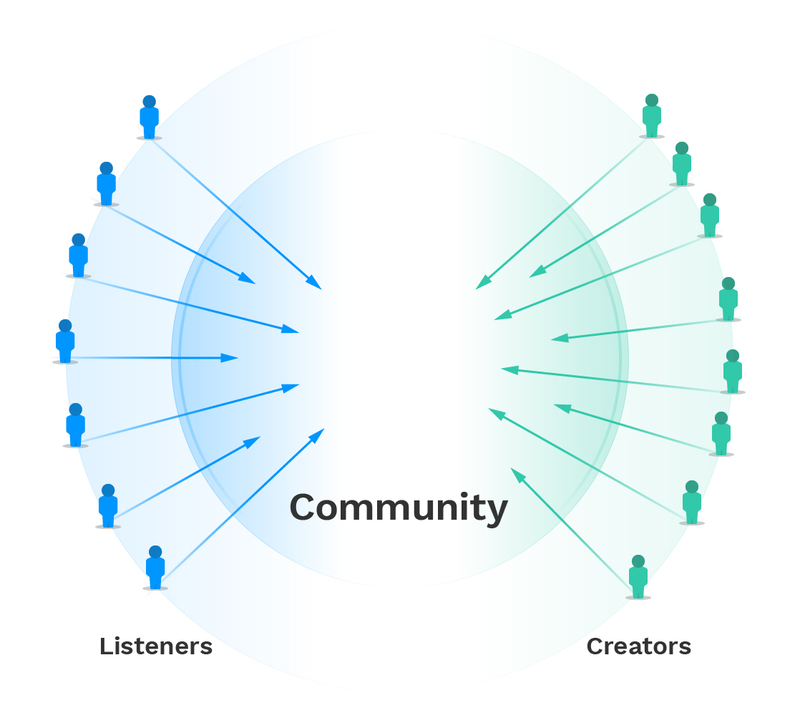 Users’ involvement is a crucial aspect of every community platform’s success. The provided solution gives a user a chance to become involved in a community through clubs or live shows. The flexibility of solution gives a user a chance to be involved as much as she/he would like to be and adapt to those preferences. Having users in mind and collaborate with them through a whole process helped to discover innovative ways of supporting their needs and desires. 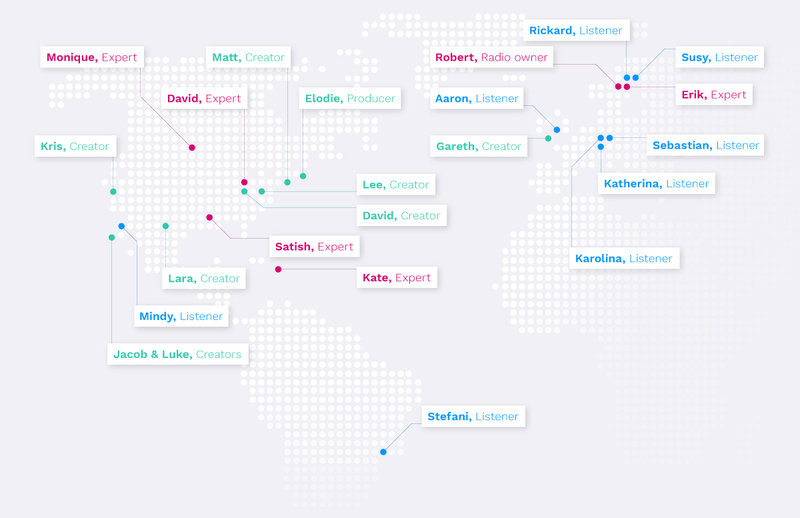 To get insights and better understand the context, I reached out to people from all over the world that have connections with audio stories. I interviewed podcasts listeners, media experts, and audio storytellers. Interviews helped me to better understand their behavior, goals and expectations for my solution. 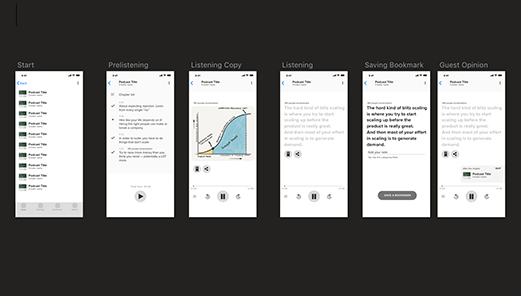 Through the research, I learned that listening to podcasts can reduce the feeling of wasted time while doing a tedious task. That is why most of my listeners immerse with the stories during commute. During this time they can get familiar with interesting perspectives and reflect on it by themselves. If you open any podcast app you will be able to choose from more than 250k of different podcasts. The choice and lack of good categorization are overwhelming for every listener. That is why listeners have a different way of finding the content. A word of mouth is the most popular form of recommendation. Podcasts shows and podcast cons are becoming popular amongst podcaster and listeners. During those meetings listeners can meet similar people, they can discuss their favorite podcasts and engage with the creators. Both of the sides have a feeling of being a part of something bigger. As outcome of analysing storytellers, I mapped their journey on a timeline. Beside the initial struggles with recording and editing a podcast, all of subsequent happy moments and struggles are related to interacting with listeners or other creators. To form a podcast community for listeners and creators, where they connect through similar interests and share inspiring content. Ideation phase followed Google Design Sprint method. Brainstorming sessions were guided by insights from the research and each week was dedicated separately to listeners and creators. Both weeks generated many ideas that were combined and narrowed down to 5 main concepts. To further explore the concept of enhancing relationships amongst listeners, I have conducted co-creation sessions. Listeners had envisioned their ideal system and structure of the podclub. 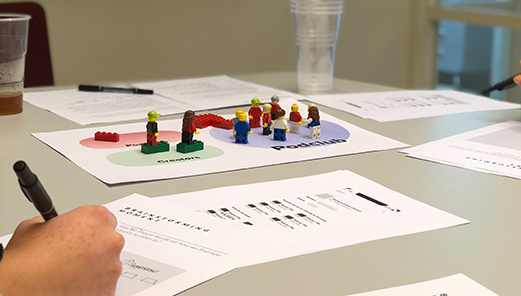 I used Lego figures to improve the understanding of the concepts and bring the tangible component to something that is abstractive. Paper sketches that represented initial ideas were translated into digital wireframes. Since the fidelity level of the built wireframes was high enough and had well thought through visual information hierarchy, the refinement actions were focused more on adding the ‘look & feel’. 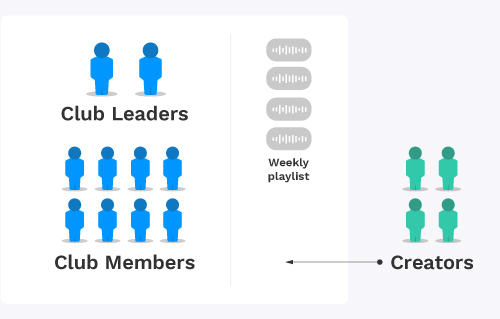 The platform has two separated products dedicated to two different group of users – listeners and creators. On the presented image you can see the role of each feature and how hose components interact with each other. Thank you for seeing my portfolio.